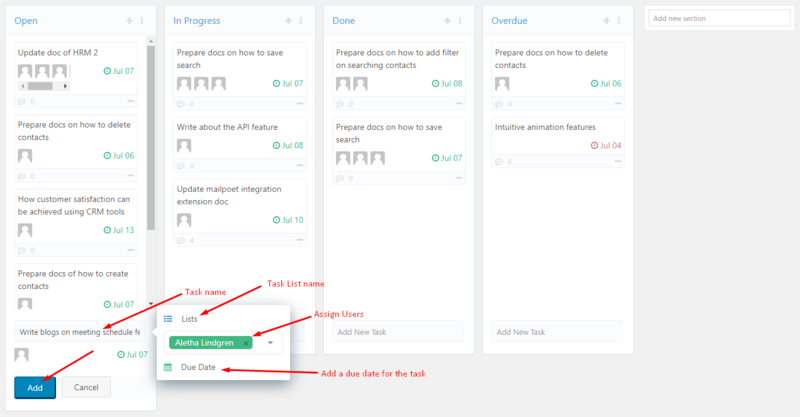 Kanban Board not only lets you select all your current tasks but also lets you create tasks within a certain project and organize them in a nice, effective and easy-to-manage way. This is a pro feature and so you will have to use the business version of the plugin. To activate the Kanban Board Module go to WP Admin Dashboard → Project Manager → Modules → Activate the Kanban Board. To access your Kanban Board, go to Project Manager → Projects → Select any project you wish to view → Click on Task Lists tab. Next, on the top right of the page, you will find two small bars one is horizontal and the other is vertical. Click on the vertical bars to view the Kanban board of your project. Open: Tasks which have yet not started, still in its idea/brainstorming level, are placed on this board. Basically, it works as the To Do board of your project. In Progress: Tasks that are being done at the moment or in progress, are placed on this board automatically. Done: The tasks that you have already completed are on this board. When you move any in-progress task to the Done board the status of that task will be shown as done in the task list. Overdue: You will find all your pending tasks here. Note 1: If you delete these boards, they are permanently deleted. You cannot get them back again. Note 2: The default boards will not contain any of your existing tasks. Either you will have to select tasks from the existing tasks using the “+” button or you will have to create new tasks using the “Add New Task” option to bring them on the boards. After that, you will be able to drag and drop the tasks among the boards. You can also rename the default boards and add custom ones. This greatly helps you to understand your requirements and customize your Kanban board according to them. To rename a board, click on its name. The renaming option will enable and type in the new name you want to give to that board. Kanban Board doesn't encapsulate you in just four default boards. 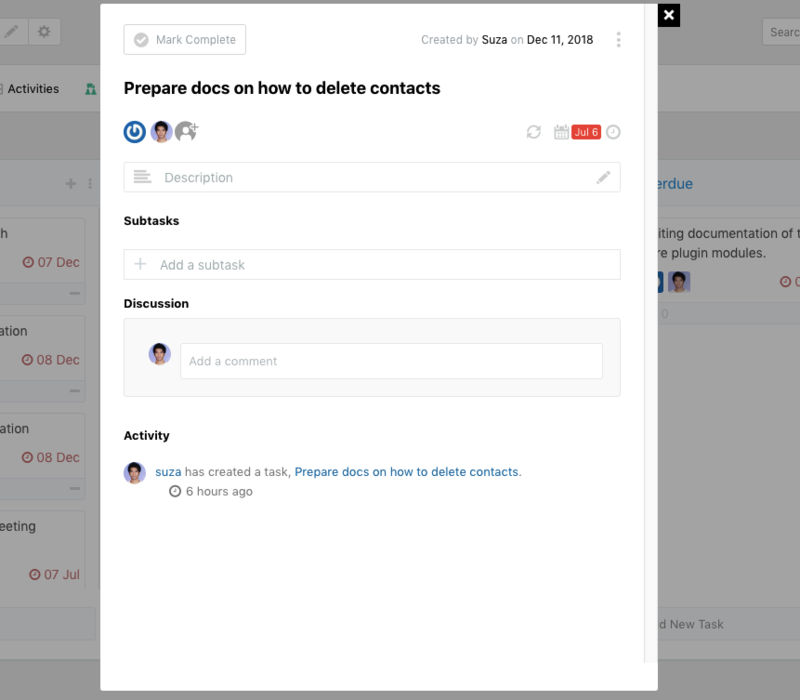 You can create custom boards and organize specific tasks under them. Click on the “Add new section” to create custom boards. If a board is no longer necessary, you can delete them as well making sure your project page remains neat and clean. To delete a board, click on the options bar beside the name of the board and click on the delete button. Please note that- when you delete a board, all the tasks under that board will also be deleted. You can add new tasks in two ways. One way is using the (+) icon and the other way is using the Add New Task option. To add a new task under a specific board, simply click “Add New Task” button at the bottom of the board. List: Pick at least one list from the available ones that you have created while creating the project. Assign User: Select a team member to assign him or her to that task. You can add as many users as are assigned on a task list. Due Date: Pick a due date for the task. After creating a new task, you can simply drag and drop them between boards as you like it. For example, if you drag a task from the Open board and drop it on the Done board, that task will be completed automatically. The system manages these according to your dropping of tasks into different boards. After clicking on the (-) sign, you will get an alert message to delete the task. Click on the ‘Ok' button to delete the task or else hit the ‘Cancel' button if you don't want to delete the task. 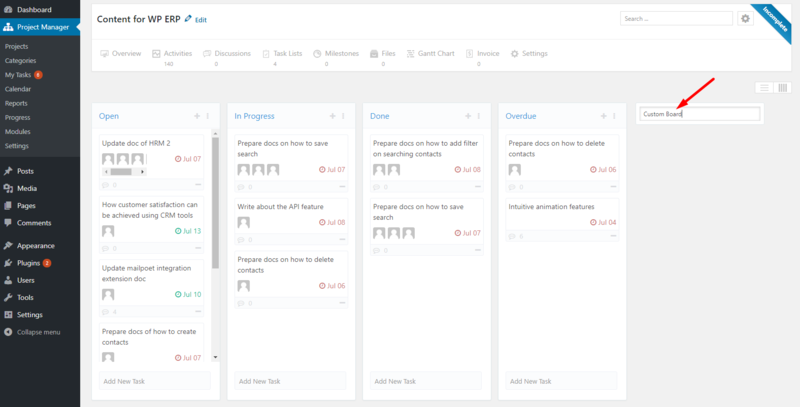 That's all about Kanban board of the WP Project Manager Pro.